Saint Martin's Catholic Church is a Roman Catholic parish in Cascade, Iowa. Cascade is partly in Dubuque, and partly in Jones county. Its two Catholic churches stand on the county line. The first accurate records of the church are dated 1853. Prior to that time, there were but fragmentary records which place the beginning of the parish several years earlier. Settlers began arriving in the Cascade area in the 1830s. During this time the Catholic settlers were organized into a congregation. This first congregation was small, and priests only serviced the congregation occasionally. 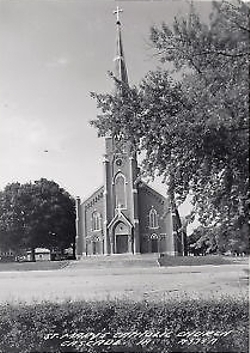 It also was not an independent parish, instead it was a mission of the Garryowen, Iowa parish. Soon the mission at Cascade was severed from Garryowen and attached to the parish at nearby Temple Hill, Iowa. An independent parish named after St. Matthias was then established in Cascade. After several years that parish was then divided into two parishes—St. Mary's was established for German residents of the city, and St. Martin was intended for the Irish residents of Cascade. The first Mass in Cascade was said in a log house by a Father Perrodin of Garryowen. About 1848, he built the first church in Cascade from which sprang the twin parishes of St. Martin's and St. Mary's. The first St. Martin's Church was brick, with an earthen floor and the interior was unfinished, the ceiling and wall never plastered. In 1865, Father Lynch secured the aid of the Sisters of Charity of the Blessed Virgin Mary for his schools, and they arrived in 1869. 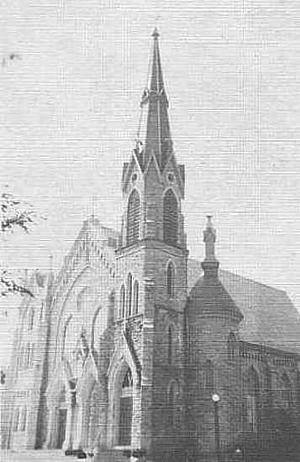 In 1882 the present church building was erected. It is of stone quarried from the Iowa Township Quarry in Dubuque County and is a beautiful Gothic structure. In 1906, a brick school building was added to the properties of St. Martin's. In the 1990s, in response to the priest shortage in the church, St. Mary's and St. Martin's were combined into a single parish which was named St. Matthias in honor of the first Cascade parish. Masses were conducted at both churches, but they shared a pastor and staff. Later it was decided that one of the church buildings should be closed. The parish council decided to keep St. Martin's open. St. Mary's was closed, deconsecrated and sold. When St. Mary's was closed, the Wangerin-Weichardt pipe organ was removed from that building. It was restored, new ranks of pipes added, and the organ installed in St. Martin's Church. © Copyright 1997–2013, The Art Department, © Copyright 2014–2019, Richard Harrison.